Everyone knows that bears love honey. 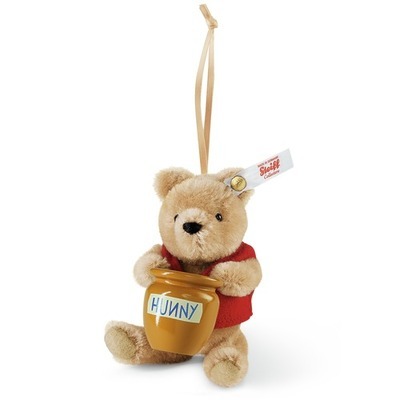 But no bear loves "hunny" more than Winnie the Pooh! Just in time for the holiday season, Steiff is pleased to present a very special ornament that's sure to be the crowning touch on your Christmas tree. A.A. Milne's Pooh is sewn from honey-coloured mohair (of course) and holds a resin "hunny" pot between his paws. The ornament hangs from your tree on a satin ribbon. It's the ideal holiday gift for young and old. No Christmas celebration would be complete without it!